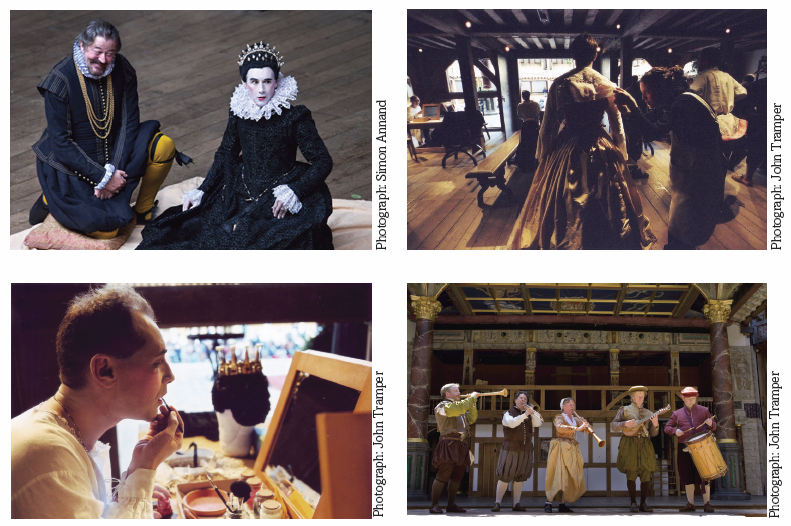 During Mark Rylance's time as Artistic Director of the Globe, he and his creative team established Original Practice. These productions recreate or replicate as many performance practices of Shakespeare’s company who occupied the original Globe Theatres. One of these was Twelfth Night, originally staged in 2002 and revived in 2012. This production featured an all male cast, as it was the practice for male actors to play female characters in the Elizabethan and Jacobean periods. In this resource, you will find interviews with members of the cast about gender, videos about costume and clothing, as well as other information on these productions. To coincide with the 2012 production of Twelfth Night, Dr Farah Karim-Cooper wrote the following introduction on what to expect from an Original Practices production and the methods possible in the Globe around 1601. When Mark Rylance was the Artistic Director at Shakespeare’s Globe, he and his artistic team pioneered a visually and aurally stunning artistic movement which has been termed ‘original practices’. But what is ‘original practices’, you may ask? The idea behind this type of production (as Mark Rylance, Jenny Tiramani, Claire van Kampen and Tim Carroll outline in Shakespeare’s Globe: A Theatrical Experiment published in 2008) is to recreate or replicate as many performance practices of Shakespeare’s company who occupied the original Globe. ‘Materials, construction, shape, iconography and context: these simple principles – principles directly inspired by the building of the theatre itself—eventually offered a framework within which we could work on the costumes, properties and hangings for what became known as our ‘original practices’ productions’ (Shakespeare’s Globe: A Theatrical Experiment, p. 62). Unprecedented was the painstaking research that went into each production to re-create the clothing the actors might have worn, the music that audiences might have heard in the space and the ways actors might have engaged with audiences. What was really fascinating about these productions was to see how the clothes related to the architecture and the painted iconography of the tiring house facade or scenic frons; and to hear original instruments in a polygonal theatre built entirely of oak, lime plaster and thatch. One of the results of this experiment in performance was a re-interpretation of the visual and acoustic worlds of early modern England. Audiences were used to seeing Hollywood versions of this period that played it fairly fast and loose with historical detail and most theatre productions that were designed with the Renaissance in mind, had not typically been designed with as much historical accuracy as these early Globe productions. Perhaps the most controversial element of a complete ‘original practices’ production (as some OP productions were only OP with regard to clothing or music and some of these consisted of mixed-gender casts) was the choice to cast only male actors. In an industry where female parts are difficult to come by, this seemed, in some views, to be a huge step backwards. But all-male casting was of course an original theatre practice in Shakespeare’s time, as women were not permitted to perform on the commercial stages in London, at least not until the Restoration in 1660. From a historical point of view, it seemed perfectly reasonable for Rylance and his team to make this choice. To offset any negative response, and perhaps fuelled by his own passion for theatrical experimentation, Rylance offered up a couple of seasons in which there would be all-female casts. I am so glad he did, but not just because it offset negative reactions, but because as a woman and a feminist, it allowed me to see more clearly the complexities of the sexual politics of the plays (e.g. Much Ado About Nothing, 2004, and The Taming of the Shrew, 2003). It was an extraordinary experiment in itself. Since then, many scholars and students have written about these productions as bold, promoting feminist readings of Shakespeare, and incredibly innovative. Not every original practice could be tested: no intervals, no directors, three day rehearsals, working with parts/ cue scripts. But these are all experiments that are indeed happening elsewhere in England, Europe and North America (The American Shakespeare Center, Shakespeare and the Queens Men Project, to name only two). What Rylance did was to respond to the great building Sam Wanamaker had entrusted him with, and this required him and the theatre practitioners who worked with Rylance to deliver Shakespearean performance in a radically different way. The chief result was the emergence of a new kind of ‘original’ Shakespeare, a Shakespeare that was simultaneously new and old—like the great Globe itself. Dr Farah Karim-Cooper is Head of Higher Education & Research, Globe Education, and Chair of the Globe Architecture Research Group. Colin Hurley discusses the practice of men playing women on stage. Colin Hurley discusses darkness and playing Sir Toby Belch. Original Practice productions from an actor's perspective. Paul Chahidi & Jenny Tiramani discuss clothing & costume in the Original Practice production of Twelfth Night.